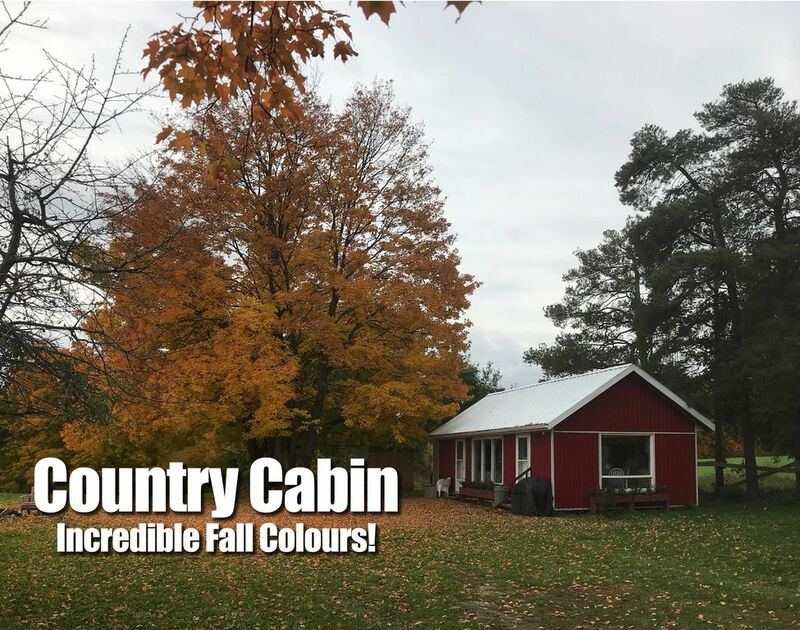 Check out the incredible fall colours at the Country Cabin! Our country get-away is perfect for those looking to get out of the city and back to nature for a short or extended stay! Enjoy a little winter paradise in the countryside and be part of it all. You’ll love our location, full kitchen, access to camp fire, wifi internet, 40" TV, three piece bathroom, laundry facilities and more. Cabin doesn't have lake or pool. Enjoy our trails, biking, being close to nature and much more. Close enough to amenities but almost in the middle of now where. Located about 50 min. from Hwy 400 / 401, 25 min. from Vaughan and Canada's Wonderland. We are also about 10 min. from a GO transit stop. Located almost in the middle of no where and yet just 10 min. from Hwy 400, our space lets you get away from it all while still close to all you need. The space is an open concept cabin featuring full kitchen, one double bed with memory foam topper and two pull out bed sofas all in a relaxing atmosphere and great view over the picturesque Holland Marsh. The Kitchen includes full size refrigerator, stove, pots, pan and most everything you'll need for cooking. Note that the cabin is not by a lake or river and does not have a pool or other area to swim. Enjoy our newly added and renovated three piece washroom and laundry facilities. Washroom features 36" glass shower with built-in niche, toilet, vanity and lighted mirror with built-in bluetooth speaker. In keeping with our property's "green" theme and giving it some rustic chic, we are featuring our own barn board (taken from our barn renovation project from a few years ago) and reclaimed wood paneling acquired from a home being demolished. This is a "green" property featuring 60 KW of solar electricity generation supplying this green energy to the electricity grid. We have also done extensive green building projects on the property including a home addition to the property's century farm house using many strategies and products that significantly reduce our carbon foot print and reduce our energy usage. As hosts, we live on the same property and are available to assist in almost any way you need. A full kitchen is available for all your needs. We do not offer prepared breakfast or cooking services. For those looking to use the near by Go Bus Route (Hwy 9 and 400), pickup and drop off arrangements can be made. We are located 15 min. from the Palsgrave / Caledon Equestrian Park and have room for horse trailers. We are also open to camper trailers that wish to join cabin renters and can provide electricity. It is perfect for those showing horses or visiting the Park! This is a quiet farming area with the cabin on a 100 acre farm property with a 40 acre tree bush lot. The local town of Schomberg is a quick 10 min. drive to local small village shopping including a 24 hour Foodland grocery store, Tim Hortons and more. You are welcome to park at the property with space for car, truck or RV. We are a 10 min. drive from Go Bus Express Route from Hwy 9 and 400 to York Dale Mall running hourly weekdays (no routes on Weekends.) Pick up and drop off can be arranged. Our property has been in our family and previously by extended family for at least 7 generations. Located on a hill with great views, it is a raised oasis of tranquility that we have enjoyed growing up here and offer to share with you. Located almost in the middle of no where and yet just 10 min. from Hwy 400, our space let you get away from it all while still close to all you need. You'll love the sense of calm and peace from the cabin and property; whether you go for a walk in the bush, enjoy the fall colours or enjoy hot chocolate in the cabin. The cabin features a full three piece bathroom featuring 36" shower, toilet, vanity with lighted mirror (and bluetooth speakers) and also includes both washer and dryer for laundry facilities. The bathroom space also features rustic wood panelling with barn board feature wall. Check out the photos. Linens are provided. They are changed and washed between guests. You are welcome to wash them yourself as you wish during your stay using the provided washer, dryer or laundry line. Dryer sheets or balls not provided. Full size fridge with freezer. Full size stove with built in oven and range. One included in the stove. Keurig available ready for your favourite K-Cups. Full compliment of standard dishes and and utensils included for dining and cooking. Dining area as part of the one-room cabin. 40" Flat Screen connected to a PS3 to provide Blu-ray player and access to Netflix and YouTube. Does not have over the air or satellite / cable TV. Connected to a 5.1 surround sound system. 5.1 Surround Sound system included connected to the PS3 and TV. Provided via a PS3. Also plays Blu-ray, Netflix, YouTube and Spotify. A selection of books in the cabin. A selection of board games in the cabin. A selection of PS3 games available. Cabin is on a large property surround by large lawn, near by gardens and treed bush area with walking trails. Easy to find, well situated within a beautiful farm scape. Recommended for anyone looking for a quick, quiet getaway. Nice quiet property, beautiful country setting. Nice quiet property, beautiful country setting, but still close enough to the city to be easily accessible. 20 mins to Canada's Wonderland or to Barry. Had a few minor issues, but the owner was great and rectified them right away.... We will stay here again. Wonderful hospitality - thank you Thom & Lisa! We loved your cozy cabin and hope to visit again for another weekend getaway at the end of the summer / early fall! Anyone looking for a cabin getaway with all the comforts (& then some) of a one room cottage, this is just the place to rest & relax among the quiet farm fields! This cabin has a split personality. It feels like a rec room that is in transition to a guest cabin. Most of our big issues are currently being addressed which will make this a 5 star property. We found it to be exactly as described. The kitchen is well stocked and roomy. The space is open and airy with a delightful view. We loved we could walk out of the door and onto some lovely wooded trails. There were some yummy zucchini muffins in the freezer for us. There are a few issues to be aware of. The owner is currently installing an attached washroom. Once this is completed this will bump the property up to five stars. Another issue we had was a lack of privacy. Some of the windows are lacking coverings, so I felt exposed at times. This cabin feels like a rec room more than a guest cabin. There was no place to put our stuff like suitcases and groceries. All of the cub boards were full. There is one extra sofa in the room not shown in the photos. It takes up space in an already crowded cabin. My feeling is even with these relatively minor issues this would be an awesome space for a party. There are 6 picnic tables and a fire pit. If I was looking for a venue for a family reunion, grad party, anniversary party, etc I would definitely look at this property. The owners are very responsive and easy to work with. The washroom she was referring to is now complete (see the pictures) and we have added blinds to all the windows to provide additional privacy and sun control. We have also re-arranged the cupboard and closet space to provide more convenient storage space for guests. We love feedback and are constantly improving the property. Check in is available at 4pm. Earlier check in may be possible. Contact us to inquire. Check out is at 12 noon. Later check our may be possible for an additional fee. Contact us to inquire. Regarding eys and access, simply contact us when you arrive to gain access to the cabin.